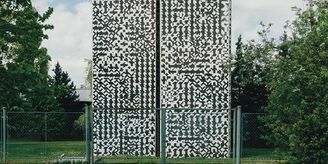 Radio Prague's shortwave transmitters at Litomysl in East Bohemia In 2001 Radio Prague was broadcasting in six languages: English, German, French, Spanish, Czech and Russian. 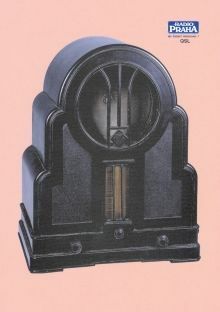 The station was broadcasting a total of 24 hours' worth of programmes per day, 3 hours of which were new programmes (one new 30-minute programme in each of the six languages); the remaining 21 hours are rebroadcasts. Rebroadcast programmes have fresh news bulletins. All programmes last for 30 minutes and have a standard layout: news, current affairs magazine, Czech press review and a feature. The theme of the feature changes each day and each section tailors programmes to suit its audience. The weekend broadcasts have a slightly more relaxed structure, they contain less news and more features devoted to the arts, social affairs, music etc. Even international co-operation has reached a new dimension. Radio Prague produces a number of programmes in co-operation with other radio stations, and also for them. 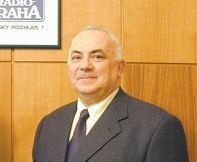 Radio Prague's Czech section produces programmes for Czech expatriates through Radio SBS in Australia, Radio Daruvar in Croatia, Radio Timisoara in Romania and several radio stations in the United States. These programmes are sent by cassette, via the Internet or down telephone lines. The Russian section uses the Internet to send its features to two radio stations in Russia. The English section works with Radio Slovakia International, Radio Budapest and Radio Polonia to produce a programme called Central Europe Today, which examines contemporary issues facing Central Europe. The English Section also contributes features to Radio Polonia's Europe East programme. Both the English and German sections co-operate with a number of European radio stations on the Radio E project. The German section works together with Radio Slovakia to produce a Czech-Slovak magazine programme. The French section contributes towards the Accents d´Europe programme produced by Radio France Internationale. The Spanish section sends programmes to several stations in Latin America. Despite all the technological advances of the last few years, shortwave remains the main broadcast medium for Radio Prague. Radio Prague uses two transmitters in Litomyl, each with an output of 100 kW, which can produce up to 200 kW. The transmitters' relatively low output and the problems associated with long-distance shortwave propagation means that reception in some parts of the world is difficult and unstable. For this reason Radio Prague organises relay transmissions using foreign transmitter facilities, with the aim of improving the coverage of target areas. Since 1998 the English and Spanish broadcasts have been relayed on shortwave by Radio Miami International in Florida. 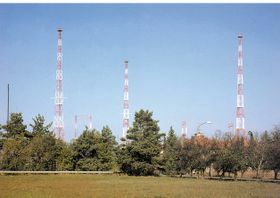 In 2000 Radio Prague returned to Slovakia's Rimavska Sobota transmitter, which broadcasts the Russian programme, and, since 2001, the German programme. In 1996 Radio Prague started broadcasting via the Internet in Real Audio and in 1999 it also began offering programmes in MP3. 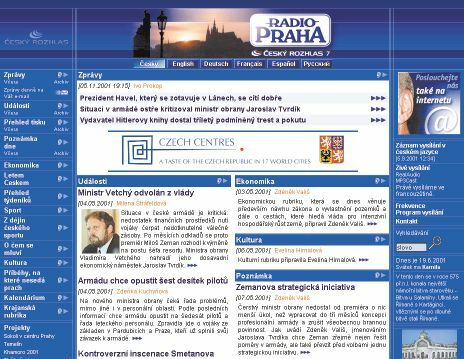 The services offered by the Radio Prague website include a daily email news bulletin, and by 2000 more than 6,000 people were using the service. The Radio Prague website offers more than just webcasts or texts of programmes. Radio Prague sees the Internet as a medium of its own, with its own specific content. 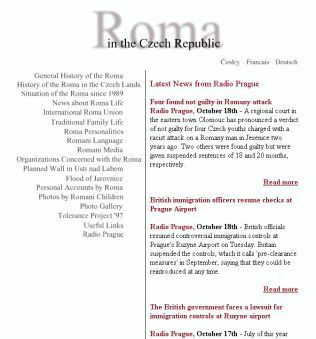 Radio Prague Roma web pages Radio Prague offers a whole range of interesting information about the Czech Republic, as well as competitions and also the "Roma pages", which offer a glimpse of daily life for members of the Czech Republic's Roma minority. The success of the Internet team can be seen in the rising numbers visiting the site. 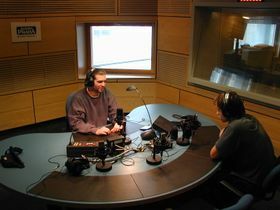 In 2001 the Radio Prague website was recording an average of 50,000 individual sessions per month. As far as satellite broadcasts are concerned, Radio Prague programmes in English and Spanish are available in North America via the Galaxy and Telstar satellites, programmes in English and German can be picked up in Europe via the Astra and Eutelsat Hotbird satellites. The satellite broadcasts have been provided since 1995 by the British company World Radio Network. Satellite broadcasts increase the number of potential listeners and also serve as a way of distributing the programme material for relay broadcasts. Radio Prague's rebroadcast partners pick up the satellite signal in the United States and Slovakia and relay the programmes on shortwave. Another advantage is that WRN provides programmes to a number of cable and radio operators in Western Europe and North America. So people can hear Radio Prague in English by cable in cities such as Berlin, Brussels and London, and also on American stations belonging to the National Public Radio network. In 1993 Radio Prague also began broadcasting again to listeners in the Czech Republic. The English programme is relayed on frequencies employed by Czech Radio's Regina Praha regional station. In 1996 an agreement was signed with the BBC, in which Radio Prague broadcasts two programmes per day on the BBC's FM frequ encies in the Czech Republic. The FM service, aimed at tourists and foreigners living in the country, has been a resounding success. Because the number of foreigners living in the Czech Republic is rising, Radio Prague is considering the introduction of FM broadcasts in other languages as well. Czech Radio studio building And while we are on the subject of new technology, we should mention the transition to digital production and broadcasting. 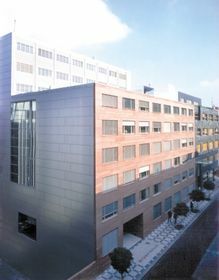 Radio Prague went fully digital in the course of 2000, when Czech Radio's brand new studio building was opened. The introduction of digital technology means that journalists no longer work with reel-to-reel magnetic tape; instead they use a combination of minidisk and computer editing to produce radio programmes. Radio Prague now broadcasts digitally using the Dalet system. Listing the station's activities would not be complete without mentioning Radio Prague's involvement in international organisations. Radio Prague is an active member of a specialised group of international radio stations within the European Broadcasting Union (EBU). The group serves as a forum for strengthening co-operation between EBU members and supporting the development of new technology suitable for international radio, such as the DRM (Digital Radio Mondial) system. In 1999 Radio Prague became a member of the Association for International Broadcasting, based in Britain. Radio Prague is also a founding member of the High Frequency Co-ordination Conference (HFCC). This international group of specialists first met in 1990 following an initiative launched by Radio Prague's veteran DX programme presenter and frequency co-ordinator Oldrich Cip. The group later founded the HFCC, and Oldrich Cip has served as the organisation's chairman since its foundation. 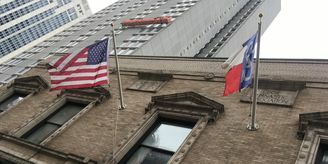 The HFCC is registered in the Czech Republic and is based in the Czech Radio building in Prague. The global character of co-ordination is emphasised by the support offered by the International Telecommunications Union (ITU). The 1997 World Radio Conference in Geneva approved the procedures developed by the HFCC and included them in International Radio Regulations. The HFCC association brings together 60 radio organisations from 30 countries that manage and co-ordinate more than 80 percent of shortwave transmissions around the world. QSL card from 2000-2001 But of course it is mainly the listeners themselves who keep radio alive. These days more and more people write to us by e-mail. Whether they use electronic or traditional mail, we still try to take the same care in addressing their criticisms and suggestions. The individual sections of Radio Prague run various listener competitions and organise meetings of listeners. Each year the station publishes a series of eight QSL cards, which are regarded as collector's items. The number of letters sent by listeners rose from 12,000 in 1999 to 13,000 in 2000. In 2001 - to celebrate the 65th anniversary of the international service - Radio Prague launched a competition, in which listeners were asked to answer two questions: "How I came across Radio Prague" and "If Radio Prague was a person, what kind of person would he or she be?" Radio Prague competition winner Juan Carlos Buscaglia from Argentina during his visit to Prague Juan Carlos Buscaglia, who listens to Radio Prague from Argentina, was selected from the 1,000 entries that we received. Mr Buscaglia wrote: "Radio Prague is a friend, who is there when I need her, who knows what my heart desires. She can hit the right strings in my heart to sound the old-forgotten melodies. And I know I would be ready to offer the same to her, if necessary. She's a friend for life and for death, a friend who accompanies me through all the episodes of my life - happy and less happy. She's a bride with whom I've been in love for 25 years." The words of Juan Carlos Buscaglia are a sign that Radio Prague will still have something to say to listeners in the third millennium.